Our 13-day Top Down Tour offers the opportunity to experience some of the most popular New Zealand attractions available on both islands. The Adventure begins on the North Island in Auckland and ends in Christchurch on the South Island, with a wealth of unforgettable experiences in between. You’ll ride the stunning roads of the Coromandel Peninsula, visit the North Island’s wine country, cross the Cook Strait to the South Island and visit the Fox and Franz Joseph Glaciers, and stop for a night at Mt. Cook before heading for Christchurch. In addition to great riding and stunning landscapes, the quality of the meals and lodging are in keeping with the high standards that have become an integral part of all Ayres Adventures. Accommodations range from comfortable, middle class hotels to luxury accommodations and “boutique” establishments that are off the usual tourist path. Airport transfer, motorcycle handover, kickoff meeting and our first dinner together! Riders arriving early can visit SKYCITY – home to the iconic 328 metre Sky Tower (the tallest building in the Southern Hemisphere), perhaps coupled with a SkyWalk – a walk around the outside ring of the SkyTower. 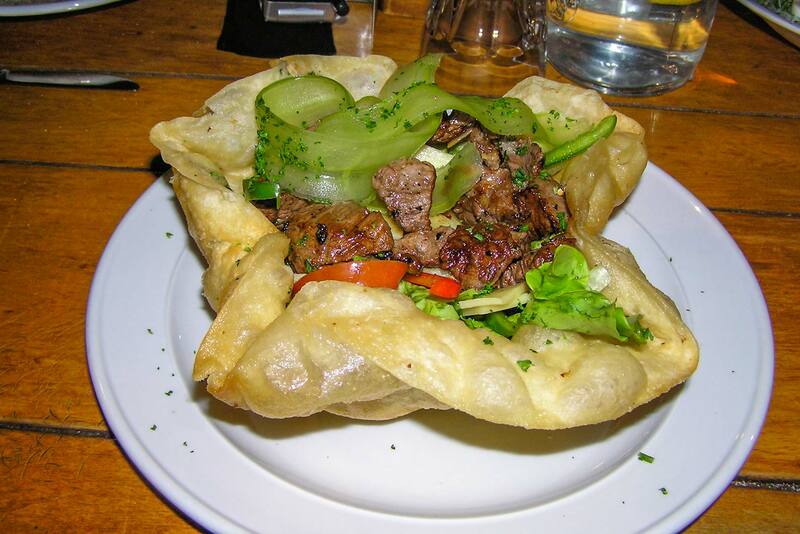 Auckland also has a fantastic selection of bars, restaurants and cafes, and the world-class SKYCITY Casino. 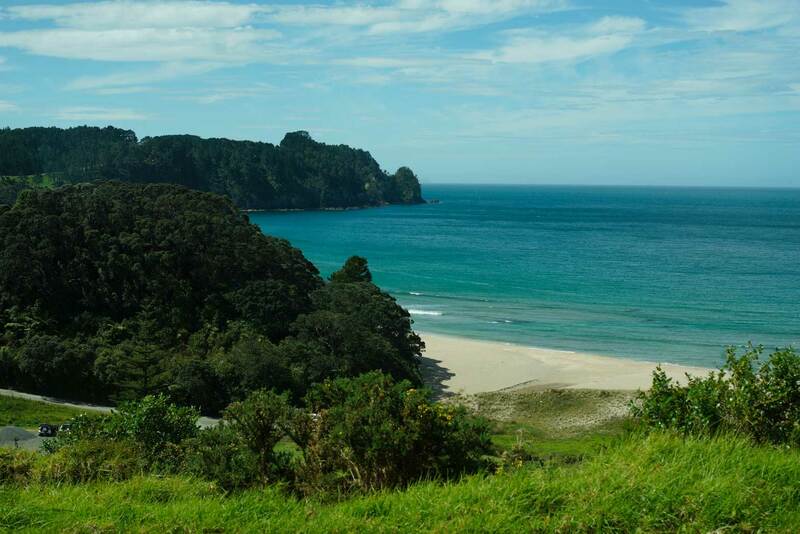 From Auckland we’ll ride south to the beautiful Coromandel Peninsula and stay in the quaint seaside town of Coromandel. It’s only an hour and a half out of the hustle and bustle of Auckland but you’re sure to be entranced by the tranquility. 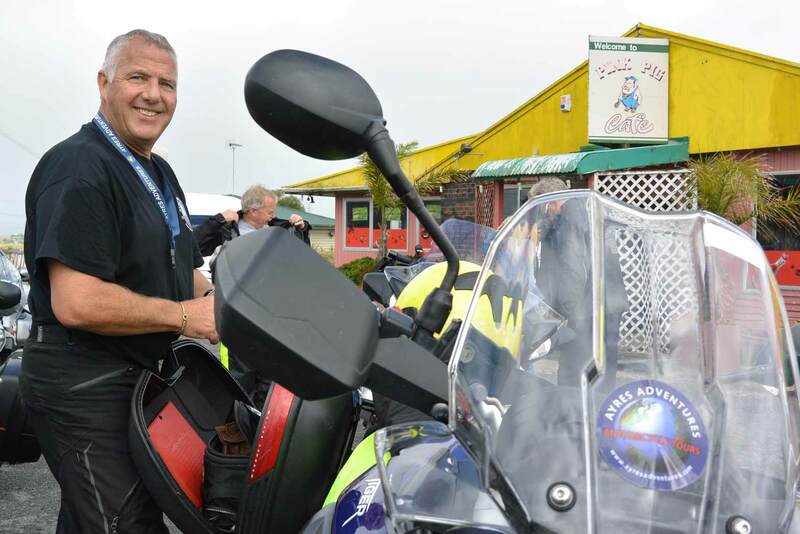 You’ll be introduced to New Zealand’s twisty roads – one of the many reasons New Zealand is considered a motorcycling paradise. 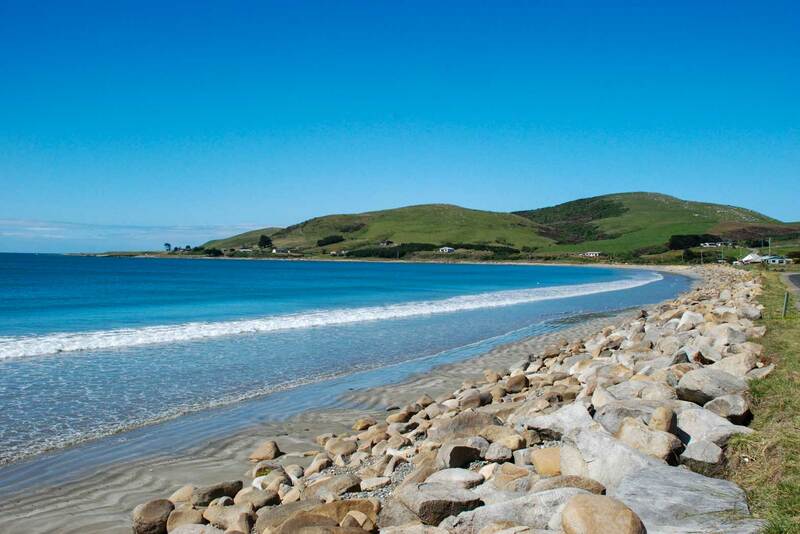 We stay at lovely lodgings close to native bush and only a stone’s throw from the water. 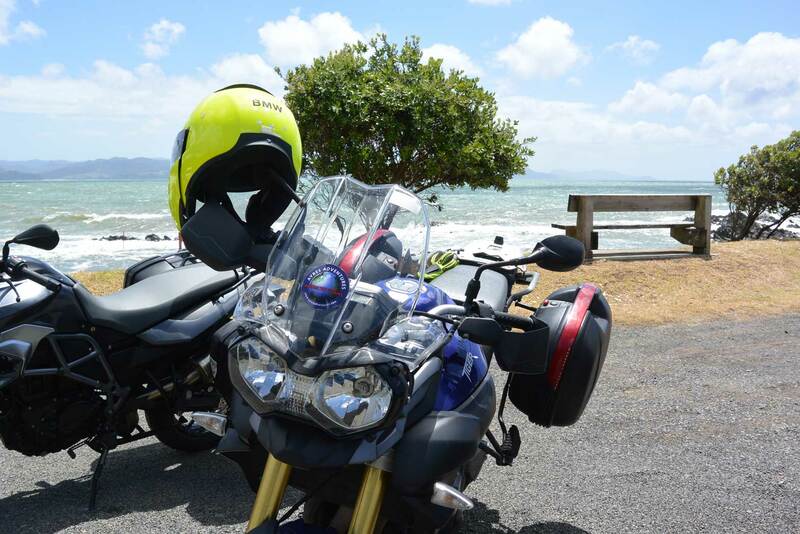 You’ll continue riding twisty roads until you leave the Coromandel Peninsula. After leaving the peninsula, the roads will include stunning sweepers, but you’re done with the tight switchbacks for a day or two. In Waihi you may enjoy stopping at the Waihi Gold Mine Lookout. It’s clearly marked from the highway and is only a short distance off the main road. 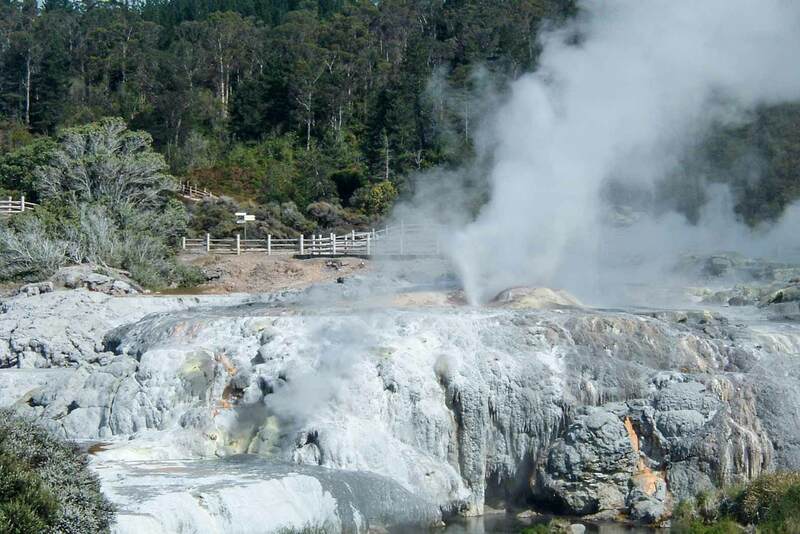 Rotorua is built on a geothermal area and is New Zealand’s cultural home. 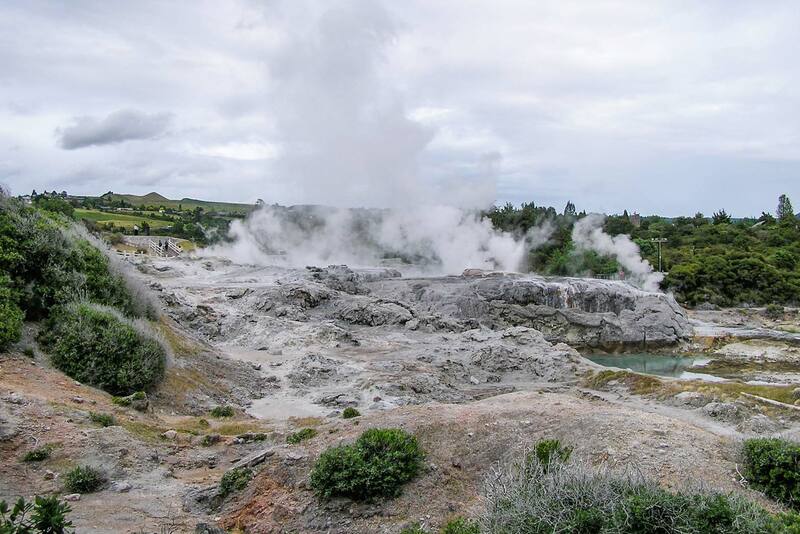 When you arrive in Rotorua you should take the opportunity to visit the famous geysers and bubbling mud pools. 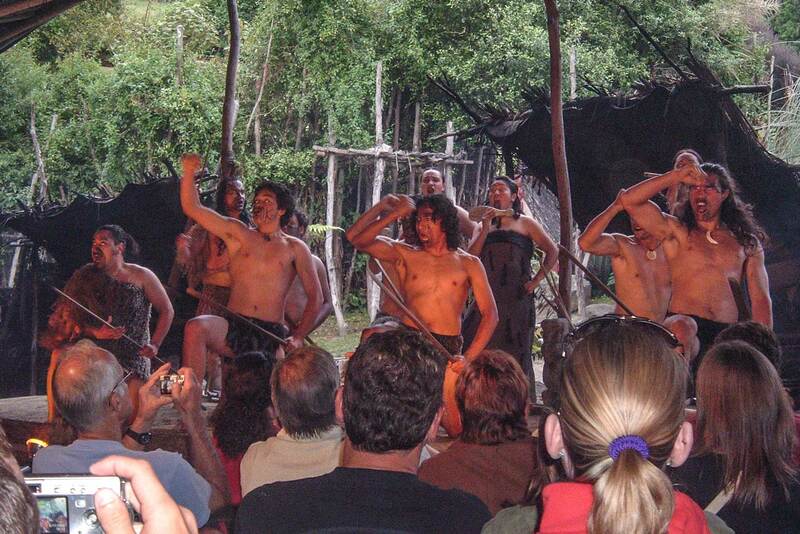 This evening you’ll attend a Maori cultural evening including a meal cooked in a ‘HANGI’ which is a traditional earth pit oven. 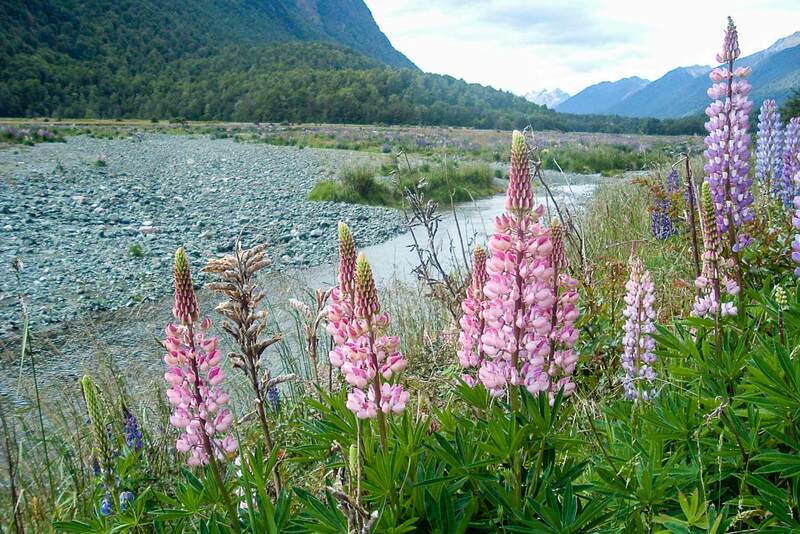 We’ll pass through the Tongariro National Park – New Zealand’s oldest National Park and also a dual World Heritage Area. Tongariro is home to New Zealand’s most active volcano, Ngauruhohe and also Mount Tongariro herself. Tongariro was used to portray Mordor in the Lord of the Rings Trilogy. Today’s ride will also include the opportunity to visit a large windmill farm. Greytown is located in one of New Zealand’s exceptional wine producing areas. There are over 30 wineries in the region and the town itself is a fabulous combination of quaint charm and fabulous shopping and cafes. If you think the riding has been good so far, it gets even better today. We ride over the twisty Rimutaka Hill to meet our inter-island ferry at Wellington before taking the three-hour ferry ride to Picton – ‘Gateway to the South Island’. 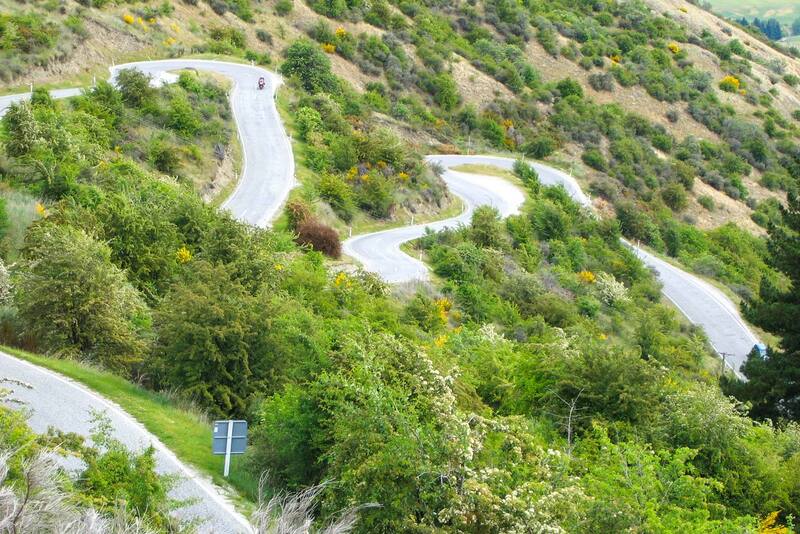 You’ll experience some lovely twisties as you negotiate Rimutaka Hill after leaving Featherston. On the ferry, you’ll be able to stay inside or you can stand outside on the deck and enjoy the weather. 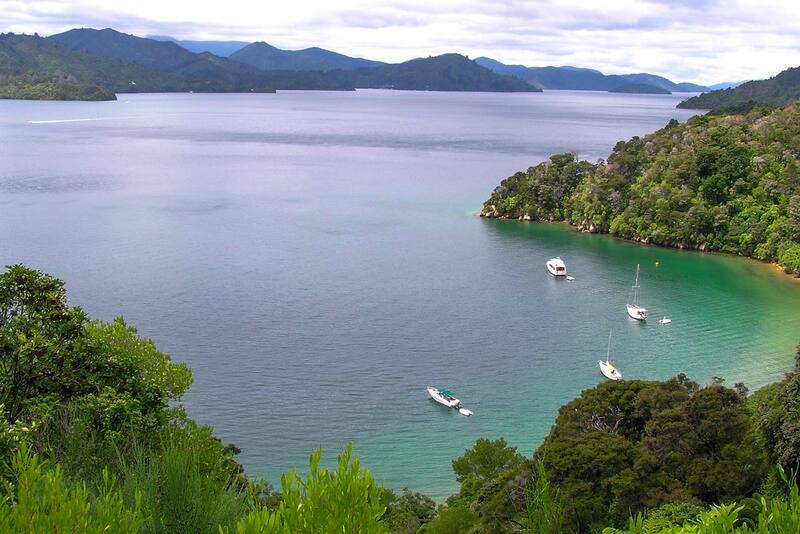 You’ll enjoy views of the famous Marlborough Sounds from the deck. 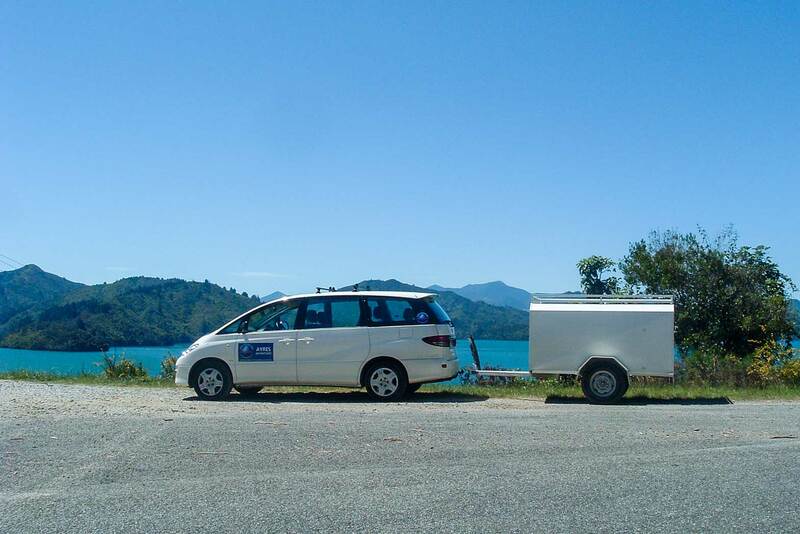 Leaving Picton, you’ll experience the Queen Charlotte Drive to Havelock, an incredibly stunning ride. There are many opportunities to stop and take photos on the way. You may wish to take a vineyard tour or perhaps visit the region’s famous arts and crafts designers, including world famous Hoglund Glass. Or, just relax at one of the many delightful cafes, restaurants or bars along the waterfront. 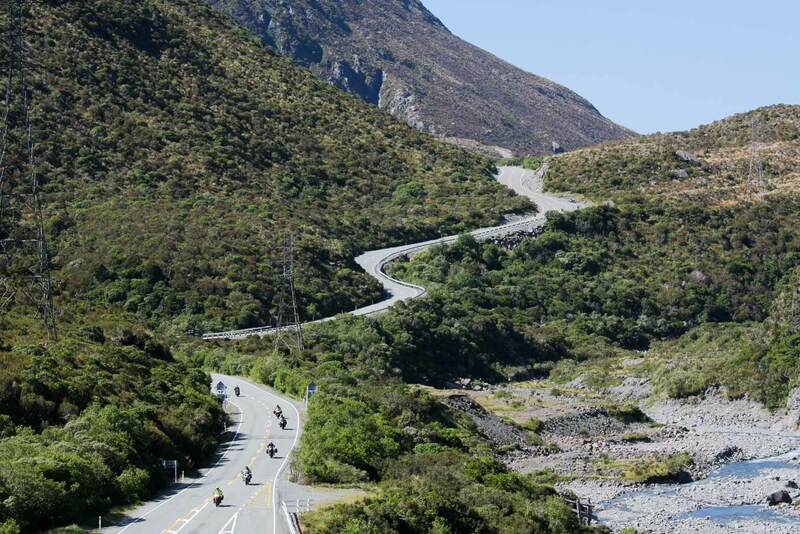 You might even ride to Takaka over the famous Takaka Hill with its fabulous twists and turns and breathtaking views! 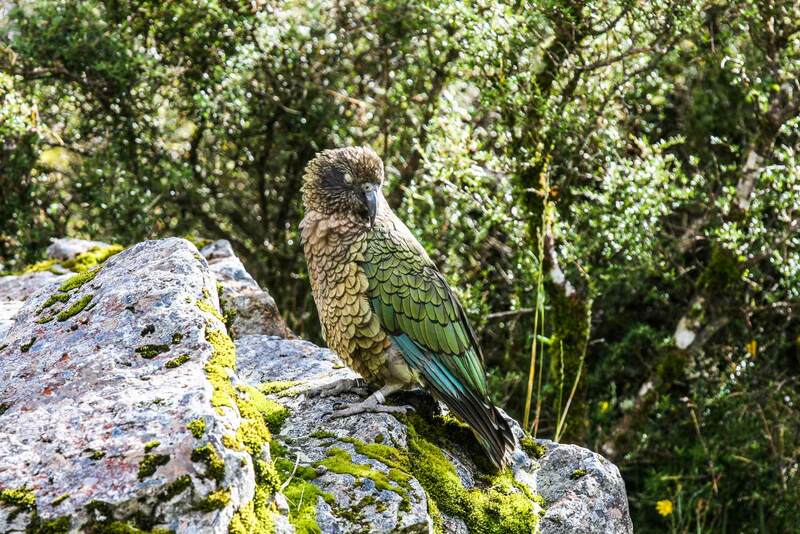 Along the way, consider passing through the famed Able Tasman National Park. If you’re interested in trying some sea kayaking you can rent a kayak on the beach. Perhaps you’ll want to ride the famous Takaka Hill. There are some interesting photo opportunities as you cross the hill, and you might like to visit the Ngarua Caves beautiful limestone caves located on the summit of the hill. 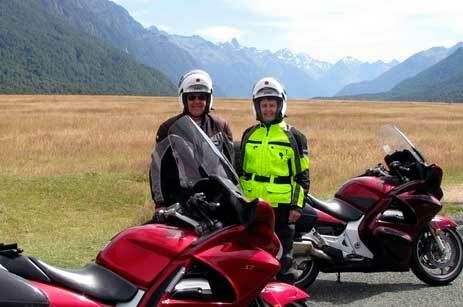 Be prepared for more awesome scenery and roads as we cross the Southern Alps, and enter the hallowed ‘West Coast’. It’s some of the best (some locals may say the best) motorcycling to be had in the world, with light traffic, stunning scenery and superb roads. 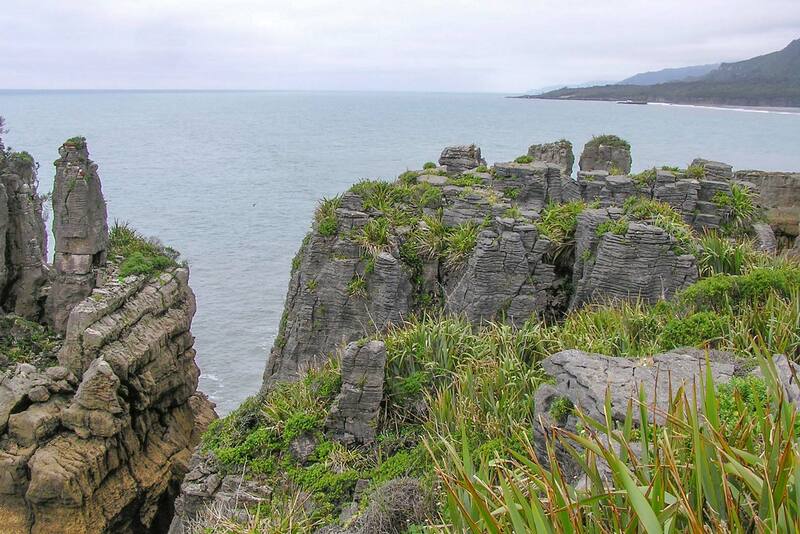 On the way we will stop off at the world famous pancake rocks at Punakaiki, where the Tasman Sea has carved massive caves and blowholes in the sedimentary limestone rock, which was once the sea bed. The beauty of the West Coast landscape is only matched by the quality of the ride…… enjoy!!!! 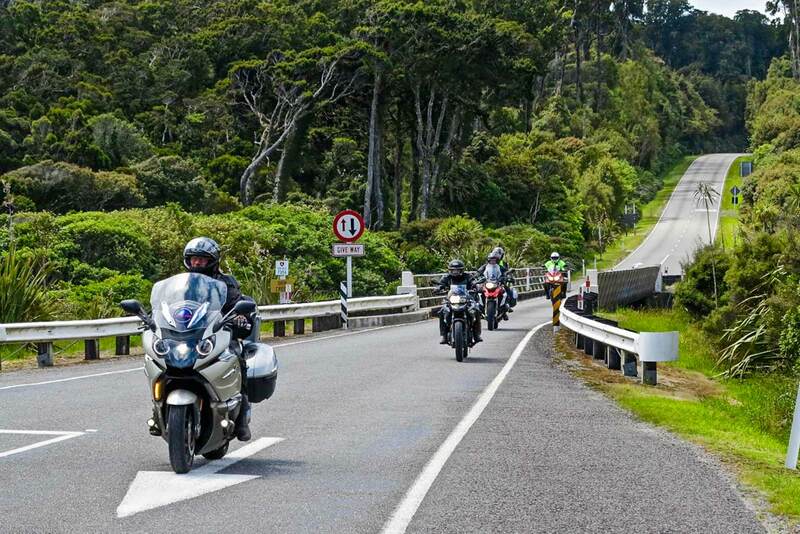 You’ll ride through lush semi-tropical rainforests and through dairy farming areas as we ride south to Franz Josef Glacier. The ride will be very pretty, with many opportunities to stop and enjoy the surroundings. At Ross (15 miles south of Hokitika) you’ll have another opportunity to visit a restored gold town and museum commemorating the areas’ gold rush days. Today’s destination, either Fox Glacier or nearby Franz Josef Glacier, is the location of two of New Zealand’s famous glaciers. 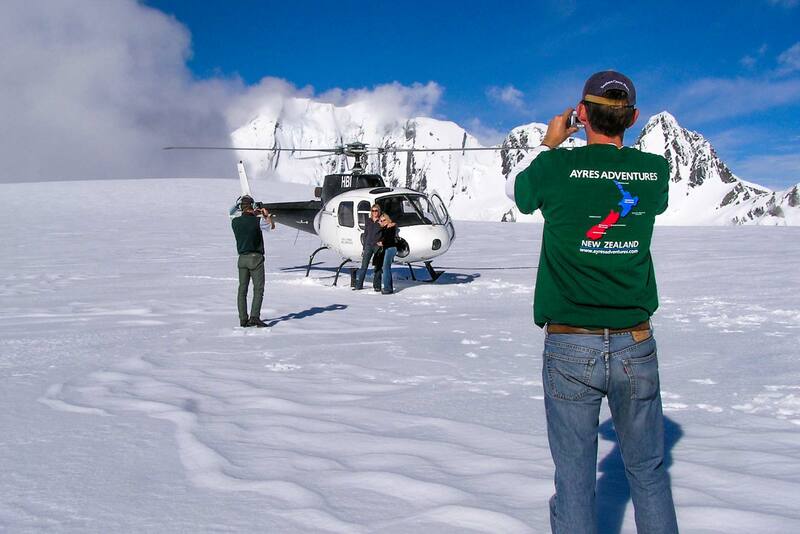 Once you arrive in Franz Josef you might like to take a scenic helicopter flight up to view the Glacier – flights even land on the Glacier for a close up view. 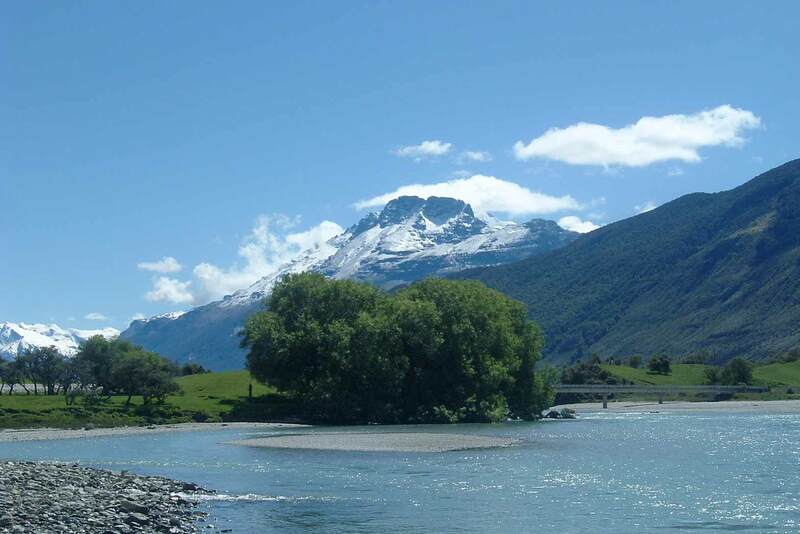 Numerous flight options include both Franz Josef and nearby Fox Glacier. Today’s ride will take you through Mt. Aspiring National Park – an area designated by UNESCO to stand alongside other places of natural significance such as The Grand Canyon, Mt. Everest and the Great Barrier Reef. 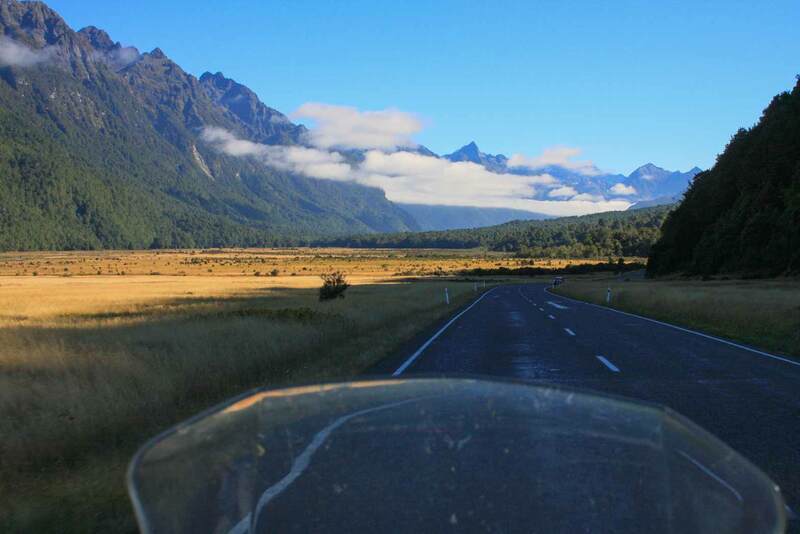 When you leave Haast Village you’ll ride through the incredible Haast Pass. Be sure to stop and take photos at Devils Gate where the road crosses the raging Haast River. If you’re interested in adventure activities, you’ll probably find a wider selection of them in Queenstown than in any other place in the world. Activities range from bungee jumping to para-sailing to thrilling jet boat rides. 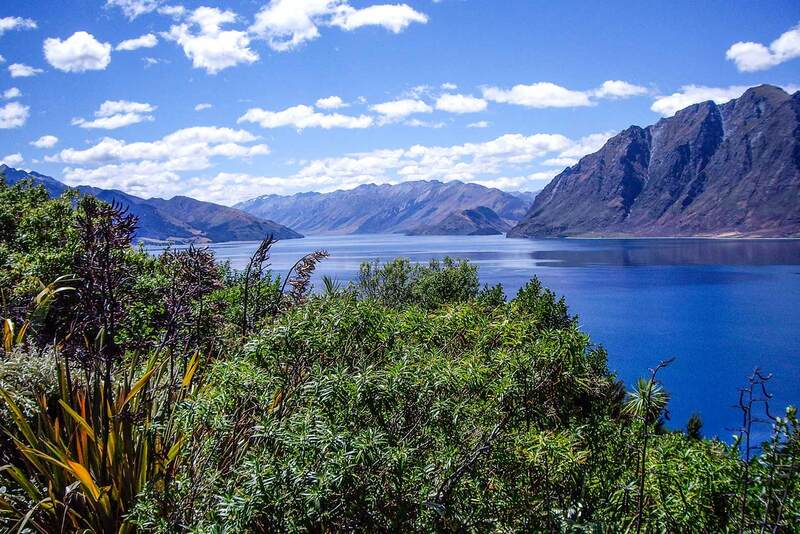 There are also some beautiful rides available from Queenstown, from the all-day ride to Milford Sound to the ride to nearby Arrowtown, which is less than a half an hour from Queenstown and which offers a nice selection of restaurants, cafes and small shops. Leaving Queenstown you’ll enjoy the golden Lindis Pass before arriving in Omarama and continuing on to the beautiful glacial blue waters of Lake Tekapo. 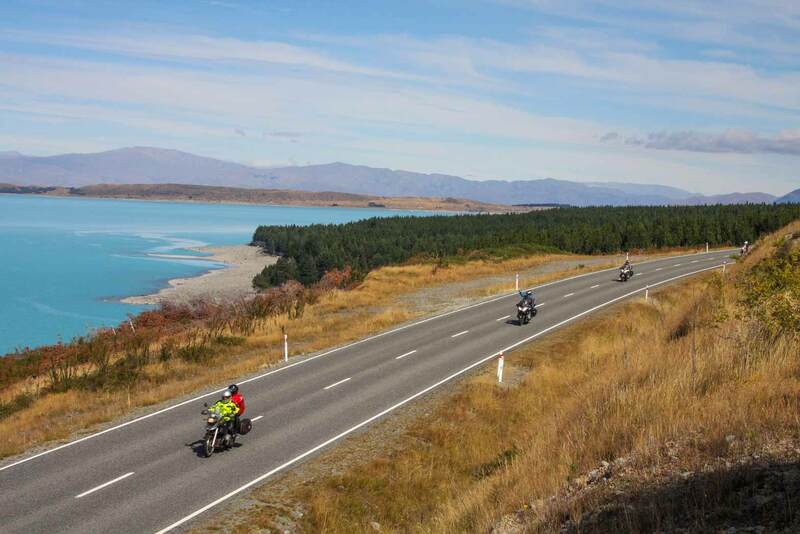 From Lake Tekapo the ride offers stunning landscapes and innumerable photo opportunities. As you arrive at the village of Mount Cook, you’ll be mesmerized by the alpine surroundings of this truly unique region. 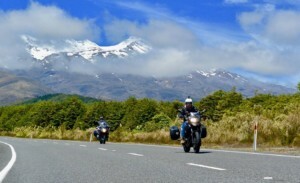 Have your photo taken with a life-sized statue of Sir Edmund Hillary or on your motorcycle with magnificent Mount Cook in the background. We’ll stay at the Motel units of the Hermitage. There are some great photo opportunities in the area and the opportunity to get up close to New Zealand’s highest mountain Aoraki/Mount Cook. 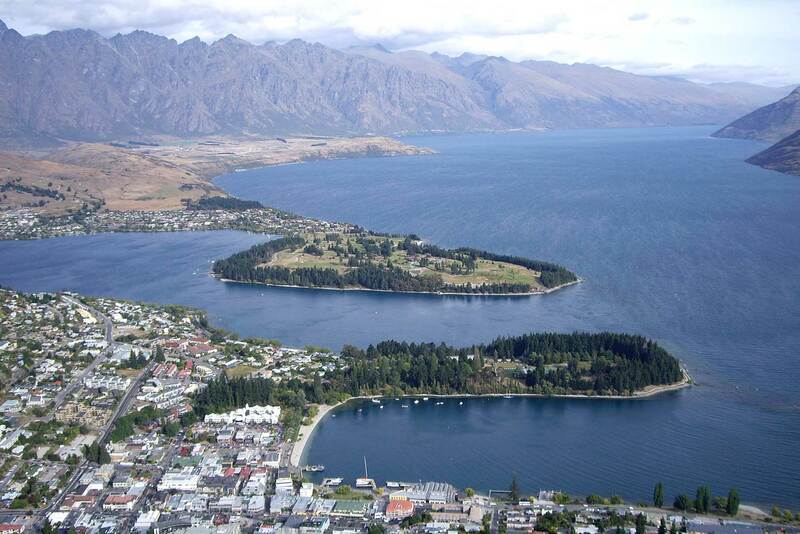 Our final destination is Christchurch, the ‘Garden City’, also known as New Zealand’s most ‘English’ city. 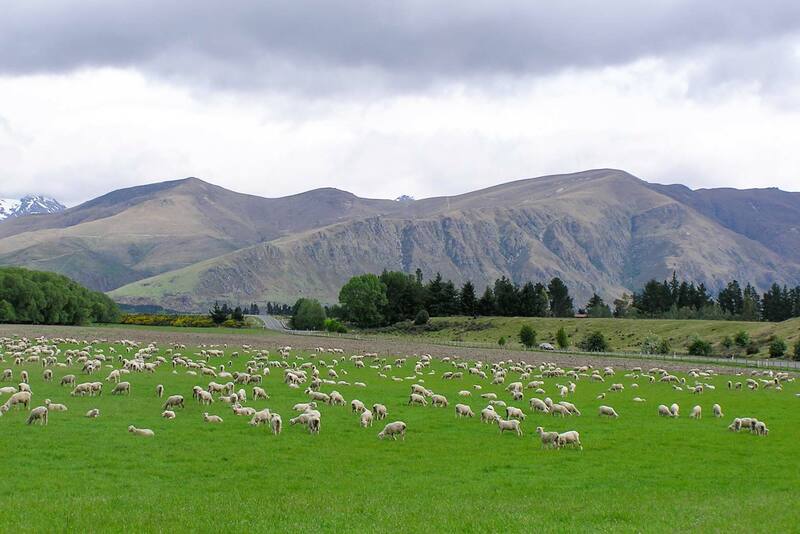 To get there we travel through the open landscape of McKenzie Country and across the alluvial Canterbury Plains. 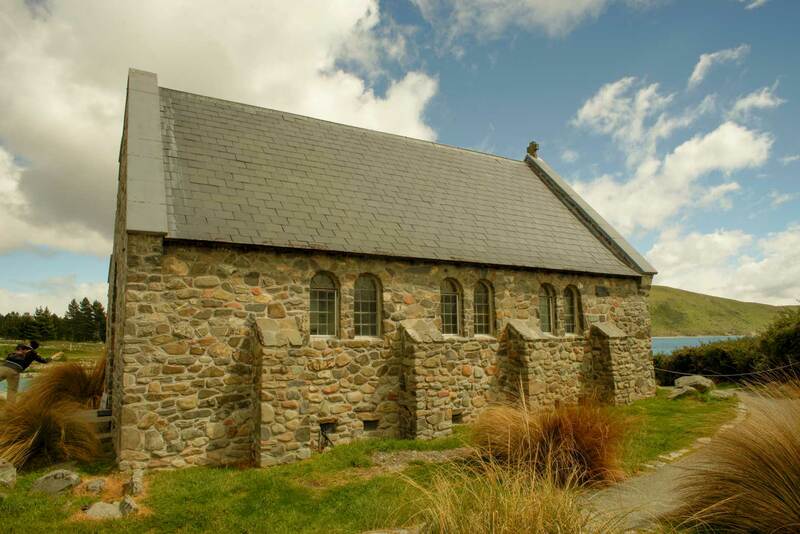 In Christchurch, you’ll be within easy walking distance of great shopping and cafes plus the fabulous new Christchurch Art Gallery and the famous Arts Centre, originally home to the University of Canterbury. Tonight we will enjoy a wonderful final dinner together to celebrate our New Zealand Adventure! After a leisurely breakfast, we will arrange transport to the airport for your flight home. I have participated in numerous tours with Ayres Adventures as well as other tour companies and can comfortably report that Ayres is the Premier touring company. They always go above and beyond to take care of the client. This is the way I want to experience this type of trips going forward! Now that I am finally back home I wanted to send some words with my impressions after this adventure in your wonderful country. This was my ninth motorcycle tour of this type and I can say without hesitation that what I have experienced this time has nothing to do with my previous tours. I had very high expectations of the tour based on the multiple things I read and videos I watched in preparation of this adventure. All of them have been highly exceeded. 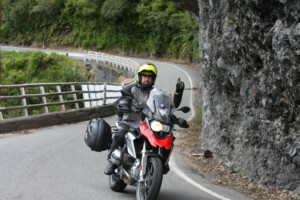 Of course the many wonders of New Zealand, as well as the quality of the accommodations and restaurants chosen, had a lot to do with that, but what really made the difference was the level of enthusiasm and professionalism that you and Jason showed every single day of the tour, taking care of every detail, anticipating any potential issue, ensuring that everyone was safely enjoying those superb riding opportunities that this country offers, and making sure that each of the participants was getting the most out of each day. If this is the way in which Ayres delivers the adventures offered in its catalogue then I am afraid that you will be hearing a lot more about me, because this is the way I want to experience this type of trips going forward. All my gratitude for this unforgettable adventure and all the strength for the times to come. 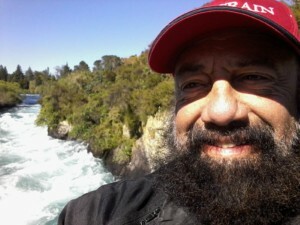 Just returned from New Zealand and the Top Down Tour and can't wait to return. 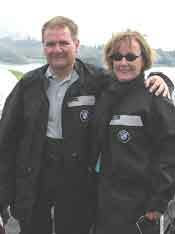 Chris and Janis could not have made a better set of guides. We cannot think of a better way to see the world! Travelling with Ayres Adventures was stellar. It was a great opportunity to tour another country with absolutely no worries. Each day we were briefed as to what the day ahead would look like and off we went. 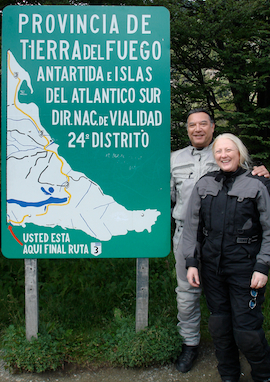 The guides, Chris and Axel, were knowledgeable, organized and a pleasure to be with. We made many stops to look at beautiful sites or to take a break. It gave us an opportunity to meet new friends and share the love of motorcycle touring. 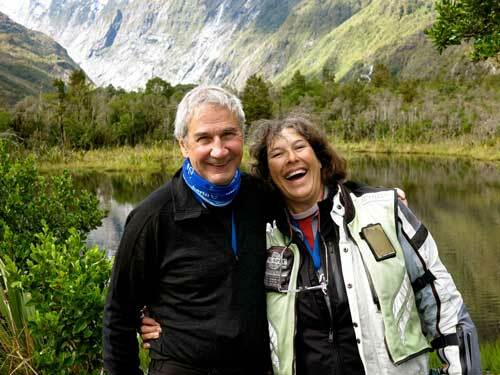 We cannot think of a better way to see the world and would definitely travel with Ayres again. After this fantastic tour, I am afraid I can never do a "normal" vacation again! Even though I had high expectations, I was not prepared for how heart achingly beautiful New Zealand is. Every day on the tour another stunning ride unfolded, each completely unique and full of surprises. The accommodations were equally unique and in prime spots, with nice meals in a variety of restaurants. Both tour leaders had a deep knowledge about the places we visited and taught us a lot. After this fantastic tour, I am afraid I can never do a "normal" vacation again! Once you travel with Ayres Adventures there is no going back! First class all the way! Awesome roads and amazing lodging. Staff brings the group together and makes everyone feel welcome and at ease. Gives us plenty of time on the bikes and off the bikes to enjoy our new friends. Does a great job dealing with the unexpected and last minute changes which are bound to happen with any event. 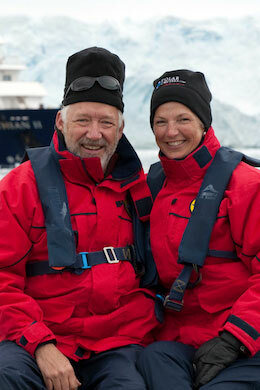 Why go with any other group - once you travel with Ayres Adventures there is no going back - they are top notch. This is my 4th trip and saving my money for the next one. More awesome than we could ever have imagined! 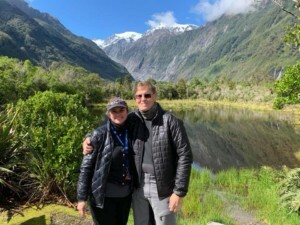 I just wanted to touch base with you about our recent trip to New Zealand with Ayres Adventures. It was a trip of a lifetime that was more awesome than we could ever have imagined. 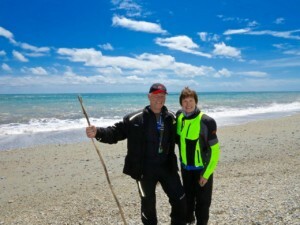 Chris and Bryn did an outstanding job in leading us and showing us their country the New Zealand way. The bikes ran great, the weather was excellent, the scenery outstanding, the roads were awesome with lots of curves, the food was amazing and our tour group of people all got along as good friends. I could go on and on, but words cannot express the fun we had on this tour. Everything was top notch! A truly amazing journey! 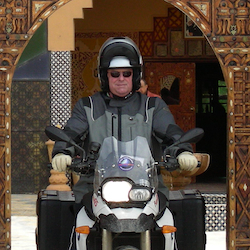 "I've taken two Ayres Adventures motorcycle tours, two years apart, on two continents - they were both topnotch! I don't normally treat myself to the finest things, but Ayres Adventures did treat us to the finest things, and they did it humbly, with knowing smiles on their faces. They knew the next site, the next route, or the next hotel, was going to knock our socks off. And, sure enough, it did! 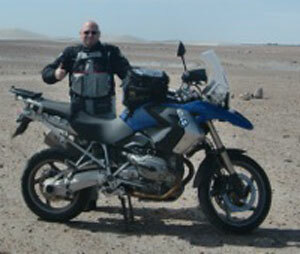 I encourage anyone considering an overseas motorcycle trip to choose Ayres Adventures as your host. You won't be disappointed"
My husband loves motorcycle touring and now I must admit I have grown to love it too! The camaraderie of our tour group, good natured people, well cared for roads, twistie turns and gorgeous scenery enhanced by beautiful silver ferns, crystal blue lakes, and of course lots of sheep! These all describe the memories I will cherish when I think about New Zealand. My husband loves motorcycle touring and now I must admit I have grown to love it too! ...Susan"
"The Antarctica trip was our fifth tour (or 6th if you count Hyder) with Ayres Adventures and once again we came away thrilled with the experience. The Antarctica portion was a life changing event, much the same as our three trips in Africa with Ayres forever changed our view of the world. Having now toured on all 7 continents, we can say that while the trip to Antarctica is costly and can be difficult at times, it is worth every cent if you enjoy adventure travel to new places. It will change your perspective of our planet and all it entails in a way that is impossible to explain unless you have made the voyage! Consider your company whole-heartedly endorsed! "When the memories of a trip stay with me every night while trying to sleep, I know that I have experienced something very memorable. I had such a good time that I signed up for your next 'Rendezvous in Rio' Adventure".